← Phillies' Bats Come up Big … etc. Is That an Acorn that McCain Has in His Cheek? 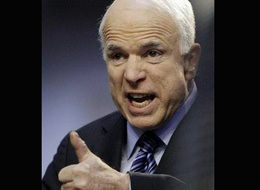 I, for one, can’t wait for tonight’s debate and Obama’s response when McCain goes after him. How Big Mac will work his fringe issues into the format should be interesting to see. The GOP has been thrusting Ayers and Acorn at us for too long to let this last debate pass by without trying to exploit them one more time – whatever logical and linguistic contortions it may require. Personally, I think it’s a bad move on their part, as it hands Obama the opportunity to respond (something he doesn’t have when they’re just smearing him in ads). But cleverly, Barack pretty much called John out. (And John, being the hot-head that he is, appears to have taken the bait.) So be it. Why do Republicans need to attack and delegitimize a damn voter registration drive?? Because a certain amount of passive voter suppression is built in to the Republican campaign strategy. If all the disenfranchised and disenchanted voters were organized and registered and informed, we’d probably be a crazy socialist 10-party country like Italy or something. The GOP engages in active voter suppression-voter ID laws and legal challenges-and the more passive kind built into the democratic process, like engendering cynicism about the democratic process. This entry was posted in Politics, Soccer, etc. and tagged acorn, ayers, Barack, campaign strategy, clinch, debate, fenway, Gawker, GOP, john cleese, Maddow, McCain, monty python, monty python's john cleese, Obama, Phillies, Rachel Maddow, Rays, Republican, republican campaign, Republicans, smear, The Tonight Show, voter registration, voter suppression, world series. Bookmark the permalink. 2 Responses to Is That an Acorn that McCain Has in His Cheek? And another thing… looking for a laugh? Click around, its therapeutic… until you realize it may actually come true, then you’ll want to throw up in a shoe. McCain and Co. really have nowhere to turn, since they lose on isses AND character. It appears that America is on to their game: while the ravenous mob (a.k.a the “conservative base”) is all riled up into the fervor of a lynch mob, Obama’s lead is growing on most major issues — including former Republican-dominated ones — and in many former “red” states, AND on issues of character. After years of sitting on their asses and allowing the neo-cons to ruin America, is it possible that this “sleeping giant” is finally waking up politically?